If you don't follow Chef Curtis Hackaday's Instagram, please pause reading right now, and go follow @curtishackaday1703 but beware - his photos will have you drooling. Those photos are actually how I chose where to dine the other evening. I hadn't been to 1703 Restaurant and Catering in Winston-Salem in several years, and with all the "liking" of Chef Hackaday's photos I was doing lately, I knew exactly where to go. And I am so freaking glad I did. When we walked in, our thoughtful, attentive and personable server Leslie made us feel right at home. I asked for a gin cocktail, and she quickly concocted the classic French 75, while my dining partners enjoyed a Dona Paula Argentinian Malbec. Saying that we were totally blown away with the presentation and flavors of our appetizers would be an understatement. Milk Buns are all the rage right now, and Chef Hackaday adds Matcha (Green Tea Powder) to his for a beautiful pale green bun. Fried Foie Gras is encased in the delicate bun - are you serious right now? Fried foie? I had never seen this done before, let alone ever dreamt of it. The foie gras literally melts in your mouth and is so savory. A tangy Pumpkin BBQ sauce has a perfect sweetness and bite to cut through the richness of the meat. This dish is outstanding. Head Cheese, Mushroom Jerky, Pig Chicharron with Pimiento Cheese! With every plate, Chef Hackaday was proving that his creativity is unparalleled. He wowed us with a Curry Risotto with Octopus, Fennel Powder and Squid Ink, beautifully painted across the plate. The artistry in the plating of all his dishes is so beautiful! The octopus was tender, like a scallop, not rubbery at all. We were so impressed with the way Chef Hackaday plays with flavors - pairing curry with fennel and squid ink? It totally works. French Bread and Cheese Bread is served with Chive Butter and was a nice interlude as we awaited our entrees. Chef Hackaday's Sea Scallops are perfect. 4 plump scallops are seared, and served on top of rich Pimiento Cheese Grits, with Wilted Greens and Broccoli. Having something green in this dish is essential to cut through the savoriness. Everything is seasoned just right, and Jalapeno Vinaigrette isn't spicy, but adds a nice peppery element. Chef Hackaday's Salmon is roasted and topped with a Chili Crab Sauce, which has a nice spice. This dish is light but packed full of flavor. Mashed Sweet Potatoes were a fabulous precursor to Thanksgiving! It's also served with wilted greens. 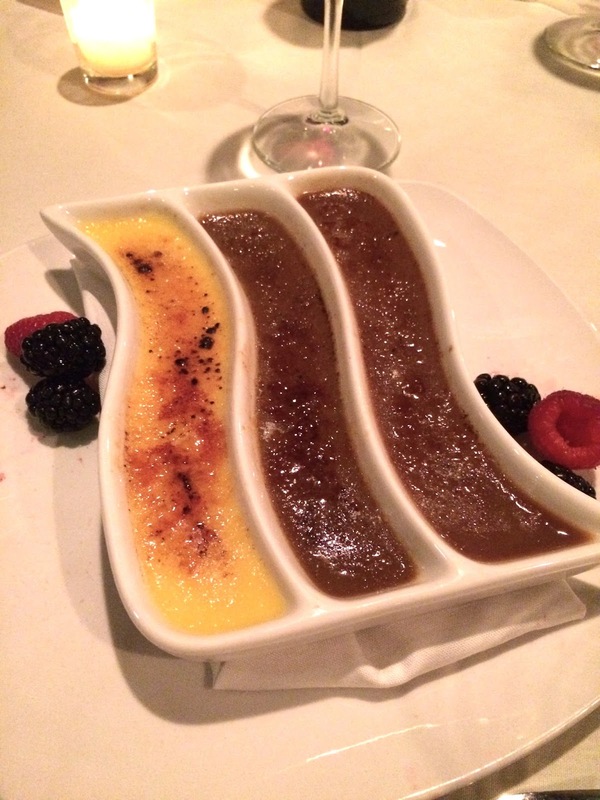 The dessert list is long, but when we spotted the words Creme Brulee trio, we didn't need to read much further. The trio includes Vanilla, Chocolate and Coffee varieties, and you really can't go wrong with any of these flavors. The custard is smooth and velvety, and rests underneath a crunchy shell of bruleed sugar. I just love breaking through the glassy topping with my spoon. Berries are on the side for a pop of color and tartness. I'm so glad Winston-Salem has Chef Hackaday! His Instagram proves that social media marketing works, and his unique and creative play with flavors is worth a trip to 1703, y'all. Trust me. I look forward to many future meals here. You can definitely see your enthusiasm in the article you write.The world hopes for more passionate writers like you who aren't afraid too say how they believe. Alll the time follow your heart.